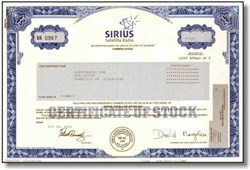 Beautifully engraved certificate from the Sirius Satelite Radio. This historic document was printed by the Security - Columbian United States Banknote Company and has an ornate border around it with a vignette of the company logo. This item has the printed signatures of the Company’s Chairman and Chief Executive Officer ( David Margolese). 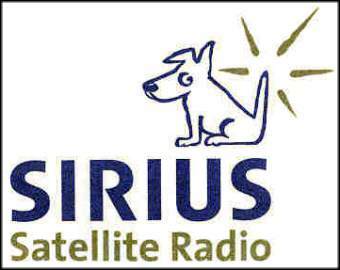 From its three satellites orbiting directly over the U.S., Sirius broadcasts 100 channels of digital quality radio throughout the continental United States for a monthly subscription fee of $12.95. Sirius delivers 60 original channels of completely commercial-free music in virtually every genre, and 40 world-class sports, news and entertainment channels. DaimlerChrysler has announced plans to offer Sirius radios in 16 models of Chrysler, Dodge and Jeep® vehicles beginning this fall. Ford is planning to offer Sirius in select vehicle lines sold in the United States, including Ford, Lincoln, Mercury, Mazda, Land Rover, Jaguar, Volvo and Aston Martin. BMW has announced plans to offer Sirius radios as an accessory in its most popular models through BMW centers across the country, including select BMW 3 Series, 5 Series, X5 vehicles, and in MINI vehicles through MINI dealerships. Nissan is currently offering Sirius radios in the 2003 Nissan Pathfinder SUV and has announced plans to offer Sirius radios as an option this fall on numerous Infiniti and Nissan 2003 models. Future Audi and Volkswagen models will also offer Sirius. Kenwood, Panasonic, Clarion, Audiovox, and Jensen satellite receivers, including models that can adapt any car stereo to receive Sirius, are available at retailers such as Circuit City, Best Buy, Sears, Good Guys, Tweeter, Ultimate Electronics and Crutchfield. On October 11, 2001, the company announced that David Margolese stepped down as Chief Executive Officer. The duties of Chief Executive Officer were assumed, on an interim basis, by an Office of the Chief Executive consisting of John J. Scelfo, Senior Vice President and Chief Financial Officer, and Patrick L. Donnelly, Senior Vice President and General Counsel. Mr. Margolese will remain as non-executive Chairman of the Board of Directors of Sirius.